Feb 2007 | 89.007 Mens. New York / Hong Kong – With a fresh new exterior and available long wheelbase version, the new 2015 Infiniti Q70 targets a new vehicle class by fusing the emotion-packed character of a performance vehicle with the comfort and exclusiveness of an extended sedan. Its evocative design, class-leading rear space, invigorating performance, innovative technology and superior craftsmanship combine to make the new Q70 a strong offering in this category. Brimming with personality, the Q70 has always been boldly original, standing out from competitors by providing true-blue sport performance with genuine prestige and user-friendly technologies. It has consistently delighted both the enthusiast driver and connoisseur of fine things with Infiniti's renowned engaging performance that never compromises on ride comfort. 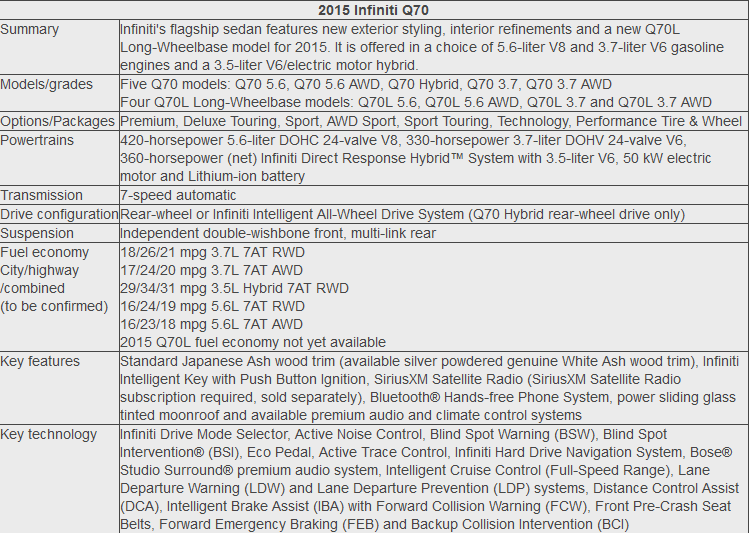 Infiniti is now extending its Q70 family with the introduction of a long wheelbase variant, as well as the regular version, to the US and other markets. The additional 5.9 inches in the wheelbase not only increases the knee and leg space in the back but also greatly augments the athletic presence of the sedan. With its compelling design and premium interior ambience, the long wheelbase Q70 broadens Infiniti's offerings for those who desire enhanced spaciousness and versatility, appealing to the sporty sedan fan who also requires executive levels of interior room. "We know our customers desire more choice and prestige. The long wheelbase Q70 is our offer to them," said Vincent Gillet, Vice President, Marketing, Infiniti Motor Company Limited. "The Q70 delivers on all accounts – attention to detail, highly crafted materials, class-leading rear roominess, comfortable ride, and superior levels of interior quietness." The refined elegance of the Q70 takes on a new dramatic design which gives the premium sedan an even more upscale image. Its flowing, emotional lines evoke a premium sleekness. At first glance, the new headlights impress immediately. Infiniti's signature LED headlights imply inner intelligence and human insight, leaving an unforgettable impression. The distinctive headlights accentuate the new double arch grille, which now takes on a more three-dimensional look due to the elaborate detail of the high-quality waved mesh finish and chrome surround. The same solid feel is echoed in the new front bumper with integrated fog lights, giving the Q70 a dignified presence on road. From the front, a strong body line rises from the grille, flowing through the bodyside like a wave and blending into the shape of the new rear LED combination lights, forming a compelling profile that highlights the Q70's sporty stance. At the rear, the new design of the tail lights creates a horizontal flow in motion while the high-quality lighting signature evokes a fresh and classy image. The top line of the trunk lid has been flattened while the rear bumper has been slimmed down to create a longer and lower visual impression, further emphasizing the premium sedan's sporty and powerful styling. The chrome rear finisher adds a touch of class to the entire rear view. The Sport version features a specially designed front bumper that gives an even lower and wider stance, and 20-inch wheels and tires, while the lower part of the rear bumper is finished in high-gloss black paint to make it look even more athletic. The design of the new Q70 continues to offer enhanced airflow over the body, resulting in zero front and rear lift as well as a low coefficient of drag of just 0.26 for the hybrid, 0.27 for the standard version and 0.28 for the Sport model. Reflecting the sensuous lines of the exterior, the new Infiniti Q70 continues to serve up a well-appointed and inviting interior with high-quality materials such as handcrafted wood accents and custom leather appointments, meticulous craftsmanship and attention to detail, as well as user-centered technologies. Infiniti has always paid special attention to the driver and, in the new Q70, the interior is designed to "fit like a glove", so that the carefully tailored and crafted cockpit becomes an extension of the driver. Important controls and switches are so intuitively located that the driver does not have to change driving posture to access them. The instrument panel consists of Fine Vision gauges and a 7-inch full color vehicle information display, while the driver and front passenger's seats are leather, heated, and feature 10-way power adjustment, including 2-way lumbar support. While the Q70 is known to have a roomy interior, the additional 5.9 inches in the long wheelbase version takes the extended sedan's rear roominess beyond what competitors offer. Rear knee room is at a best-in-class 32.4 inches, so rear seat passengers can comfortably cross their legs. The rear ingress and egress are also top in segment, which makes traveling in the back of a premium sedan a more enjoyable experience for taller passengers. On top of offering rear door auto closure, the long wheelbase version of the new Q70 also provides additional features for rear passengers such as heated seats, reading lights, and a 12V power outlet. The new Q70 is now quieter than before, even at high speeds. Infiniti engineers have added noise insulation materials, increased the sealing, and stiffened the wheels, resulting in a reduction of road noise on urban roads. The isolation feel at highway speeds on the long wheelbase version is a class-leading 77%, further cementing the Q70's lead ahead of competitors. Contributing to the cultivated in-car atmosphere,the Active Noise Control feature monitors cabin noise levels and generates "canceling" sound from four door speakers to reduce noise, so it's easier to hold conversations in the car or to better enjoy the music. Premium audio systems include the Bose® Studio Surround® sound system with digital 5.1-channel decoding and 16 speakers, two of which are mounted in the shoulders of each front seat. Other features include Enhanced Intelligent Key, which remembers last used audio, navigation and climate control settings for each key, Bluetooth® Hands- free Phone System, dual-zone automatic temperature control, and available next-generation Infiniti Hard Drive Navigation System with 8-inch WVGA color touch-screen display. Building on Infiniti's focus to make owners' lives easier, the Q70 comes with Infiniti ConnectionTM telematics services, which include the Infiniti PersonalAssistantTM,a24/7personalconciergeservice. Staying true to its roots of sporty precision, the new Q70 is the result of methodical calibration by Infiniti engineers who have utilized smart technologies to achieve the exact balance of ride comfort and handling, performance and fuel economy. A range of powerful and highly efficient powertrains is available, starting with the 3.7-liter V6 and 5.6-liter V8 petrol engines, both of which are equipped with Variable Valve Event & Lift (VVEL®) that combines hydraulic-controlled variable valve timing and electronically controlled variable valve lift on the intake side to help improve performance and response. The refined 3.7-liter aluminum-alloy DOHC 24-valve V6 is rated at 330 hp @ 7,000 rpm and 366 Nm (270 lb/ft) of torque @ 5,200 rpm, while the powerful 5.6-liter Direct Injection Gasoline (DIG) aluminum-alloy DOHC 32-valve V8 is rated at 420 hp and 565 Nm (417 lb/ft) of torque for the standard model and 416 hp and 561 Nm (414 lb/ft) of torque for the long wheelbase version. Also available is an award-winning hybrid powertrain featuring the Infiniti Direct ResponseHybrid® systemwithIntelligent DualClutchControl. It combines a 3.5-liter 24-valve DOHC aluminum-alloy V6 and compact laminated lithium-ion battery design with an innovative one-motor/two-clutch motor control. The system's V6 is rated at 302 hp @ 6,800 rpm and 350 Nm (258 lb/ft) of torque @ 5,000 rpm, while the advanced 50 kW electric motor is rated at 67hp and 290Nm (214lb/ft) of torque.Infiniti's approachtopetrol- electric hybrids is to use the electric motor to boost performance and power, much like how a traditional supercharger would function. This gives the Q70 an immediate surge of torque in the low revs before the 3.5-liter V6 kicks in to push the overall power output to 360 hp. This hybrid powertrain propelled the then Infiniti M® Hybrid into the Guinness World of Records® as the world's fastest accelerating full-hybrid car in September 2011, and went on to be the only hybrid named to the prestigious "Ward's 10 Best Engines" list in 2012. Billed as a "driver's hybrid", the powertrain delivers speeds that appeal to the sporty driver, and clean power that pleases everyone. All the engines are matched to an advanced 7-speed automatic transmission, which allows for sportier shifts during spirited driving. Solid magnesium paddle shifters are also available. Customers can choose between rear-wheel drive or Infiniti's Intelligent All-Wheel Drive system, which uses an advanced torque split control strategy that automatically redistributes torque to the wheels according to road and driving conditions, ensuring sure-footed road holding at all times. In line with the focus on the driver, the new Q70 features technologies that enable individuals to customize the driving feel. The unique Infiniti Drive Mode Selector allows drivers to select from four driving modes – Standard, Eco, Sport or Snow – and the integrated control system will adjust throttle sensitivity and transmission mapping to help optimize performance. To encourage eco-driving behavior, the available Eco Pedal provides feedback directly through the accelerator by giving a slight pushback if driving inefficiently. The new Q70 utilizes the advanced Front Mid-ship (FM) platform, which positions the engine behind the front axle, resulting in an optimized front-to-rear weight balance. Laser welding is carried out at critical locations to help enhance lateral bending stiffness, torsional stiffness and suspension mounting point stiffness. Precise handling is provided by an independent double-wishbone design at the front and multi-link independent suspension in the rear, along with front and rear stabilizer bars. The rear suspension geometry has been designed to provide a quiet, comfortable ride. The available double-piston shock absorbers control damping force according to the frequency of input from the road surface for a smoother ride. To increase ride comfort on the new Q70, Infiniti engineers have further tweaked the shock absorbers to respond with greater precision to inconsistences in the road surface so as to minimize uncomfortable "shaking and bobbing" as well as reduce the vibrations when driving on uneven roads. The steering system on the new Q70 is an electronically controlled speed- sensitive variable-assist powerrack-and-pinion design. Helping the driver to maintain control of the vehicle at all times is Infiniti's advanced Vehicle Dynamic ControlwithTractionControlSystem.Theavailable Active TraceControlfeature also adjusts engine torque and braking at each wheel to help enhance cornering performance. Infiniti places maximum value on integral safety, going above and beyond the measures assessed by safety institutions. A core element of that strategy is the Infiniti Safety Shield®, a comprehensive approach to safety that offers layered technologies to help provide safety and convenience by monitoring conditions, helping drivers avoid a collision, and helping protect vehicle occupants if one occurs. Infiniti adds four innovative technologies to the Q70's long list of safety and security systems, which are available depending on the series. The new Predictive Forward Collision Warning system, which debuted on the Q50 and warns the drivers of risks that lie beyond the driver's field of view, can sense not only the relative velocity and distance of a vehicle directly ahead, but also of a vehicle traveling in front of the preceding one. AnotheradvancedtechnologyistheAroundView® Monitorsystem,whichtakes the hassle out of parallel parking. The feature shows a bird's-eye view of the vehicle in relation to parking lines, using four vehicle-mounted cameras that create a 360-degree view of what surrounds the vehicle and displaying it via the in-dash screen. The system includes Moving Object Detection which alerts the driver to moving objects around the vehicle when pulling out of a parking space or backing up. Adding another layer of safety, the Backup Collision Intervention® system is a pioneering technology which intelligently senses what the driver may miss when backing up, and can apply the brakes momentarily to help avoid a collision with vehicles and objects crossing its path. Forward Emergency Braking detects danger of collision with a vehicle ahead and warns the driver with visual and audible warnings. If the driver fails to decelerate, the system will apply an emergency brake and decelerate to either help avoid a collision or mitigate the damage if the collision could not be avoided. Other safety and driver assist systems continue to give the driver and passengers peace of mind. Both the Lane Departure Warning and Lane Departure Prevention (LDP) systems help keep the Q70 from unintentionally drifting into an adjacent lane in case the driver is distracted. Using a small camera behind the windshield to detect lane markers ahead, the technologies calculate the vehicle's position relative to those lane markers and warn the driver of a potential unintended lane departure with visual and audible cues. If the driver does not steer the vehicle back toward the center of the lane, the LDP system assists the driver with a gentle application of brakes. The driver will also have greater confidence when changing lanes with two technologies that target the blind spots. Blind Spot Warning helps alert the driver to vehicles detected in the blind spot area, while Blind Spot Intervention® actively intervenes by selectively braking if the driver ignores both visual and audible warnings and attempts to steer into the path of the vehicle in the blind spot. Other safety features such as Intelligent Cruise Controland Distance Control Assist take the stress out of driving so the driver can arrive at his destination relaxed. "The new Q70 is a no-compromise premium sedan," said Gillet. "It pushes every boundary in performance and comfort, delivering a drive that's exhilarating and rewarding every time." Ago 2013 | 19.384 Mens. Me gustan mucho los sedanes de Infiniti. Me parece que tienen un diseño mas homogéneo y agradable que los coches de su rival Lexus. Ago 2005 | 5.177 Mens. Muy bonito, aunque tiene pinta de que costará una burrada, no? Sep 2009 | 1.898 Mens. Ene 2014 | 241 Mens. Oct 2012 | 976 Mens. Luego costará casi lo que el Ghibly y más que un mercedes E y se venderán 4. Gran facelift;mi única pega, el diseño del volante, demasiado "soso-clasico"; uno de 3 radios opcional al menos le hace falta sin duda. Ago 2006 | 11.428 Mens. Ago 2005 | 18.953 Mens. El M, al contrario que el lexus GS, se ve más imponente en vivo que en foto. Que bonito coño, cada vez me gustan mas estos "Nissan". Feb 2004 | 16.135 Mens. Se confirma la introducción del motor MB 2.2d en la gama europea del Q70. Mar 2010 | 5.507 Mens. Abr 2006 | 20.305 Mens. Opino que el interior, aunque bonito, no se ve tan moderno cómo la competencia. Por el resto me gusta mucho. Abr 2003 | 15.250 Mens. Es que se esperarán a la siguiente generación del Q70. Abr 2006 | 6.228 Mens. Parece un Hyundai Sonata. Horrible. Última edición por ATTICO fecha: 29-ene-2015 a las 00:07. Esta muy guapo, lo único que no me gusta es la silueta del morro, el resto de coche armonioso y el interior sublime. Dic 2006 | 4.473 Mens. Jun 2009 | 87.947 Mens.